This week we are excited to share another Young Debt-Free Family story from Laurie at The Three Year Experiment. Laurie blogs about her young family’s journey to becoming location independent within a three year period. 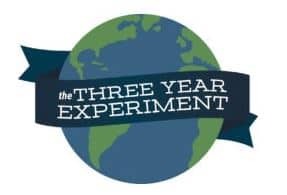 The tag line at the Three Year Experiment is “My family became location independent in three years by managing the ben-ha-meens!” It took me a second to understand exactly what this meant, but once I did, it brought a smile to my face. As you’ll read below, Laurie’s family’s story is full of ups and downs, including job loss, relocation, new car purchases, and more. All the while Laurie and her husband were growing their young family. Like many in the personal finance community, her family got their start in improving their finances through Dave Ramsey’s book and Financial Peace University. I know not everyone loves Dave Ramsey, but it’s amazing to me how many people in the personal finance community got their start through his material. On the blogging front, Laurie is absolutely killing it. We are in a blogging group together and participated in a writing challenge in February. She dominated everyone by writing 20,000 words in a single month. That’s like one third of an entire book. Amazing! I can’t wait to see how Laurie continues to grow The Three Year Experiment. Read more below about Laurie and her family’s journey to pay off debt, become location independent, and grow their net worth. They have such a beautiful family as you’ll see from the pictures below and I hope you enjoy the story of The Three Year Experiment as much as I did! 1) Start by telling us about yourself. Please include any details you feel comfortable sharing about your family, job situation, income level, and amount of debt paid. I’m Laurie and I’ll start by saying that my family is probably a few years past the “young” stage. I’m 39, my husband is 45, and our boys are now 11 and 8. When we started our debt repayment journey, though, we only had one son who was about 18 months old. Don’t worry, it didn’t take us ten years to pay off all our debt! But we had to learn some lessons twice, so I thought our story would be a great case study for young families. When we started our debt repayment journey, my husband worked for a Fortune 50 company in marketing, I had just become a stay-at-home mom, and we were adjusting to life as new parents. It was July 4th, 2008, and my husband had been laid off six months before. It was the middle of the housing crisis, and his company had been hit hard. They laid off thousands of employees. At first, we were frantic—he’d received a 3-month severance, but what would we do after that? After all, I was no longer working, we had a mortgage, and we now had a young son to support. 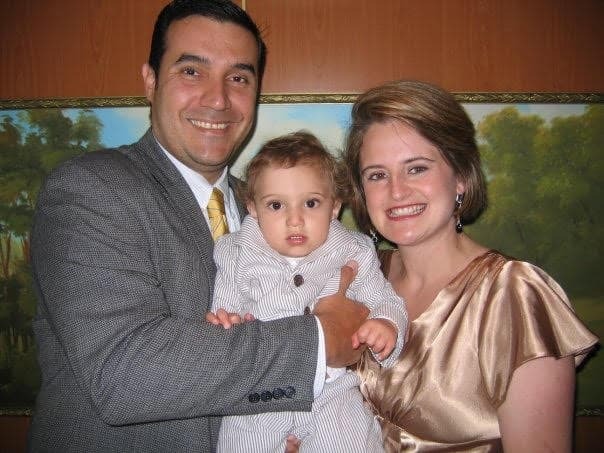 Laurie’s family in 2008, a month before they began their debt repayment journey. Before he’d been laid off, he’d made a good salary—not six figures, but close—and although it had been hard to lose my salary and health care benefits, we had slowly adjusted our spending down, though we couldn’t get rid of our credit card balance. We were blessed by an old boss who found contract work for him to do. She gave him a job at another company, working 40 hours per week. It even paid more than the first, which was amazing, since we had to shell out over $1,400 per month in health insurance. We were beyond grateful. Quickly, though, it became apparent that the contract job wasn’t right for him. It involved writing in English, and as he’s Chilean, that was a huge challenge to write persuasively in his second language. He was holding on to the job by a thread. 2) What inspired you to payoff your debt? Did you have a specific moment where you decided to make it a goal to payoff your debt? Yes, it was with that backdrop, on July 4th, that I walked into Barnes & Noble and wandered into the personal finance section. I’d always been interested in investing, but that was the day I picked up Dave Ramsey’s Total Money Makeover for the first time. I sat down and read the first half of the book on the floor of the store, then bought it on my credit card, vowing that this was the last thing I’d put on my credit card that year! I went home and vomited my newfound enthusiasm for a debt repayment plan all over my husband. He thought it sounded like a good idea, especially because of his precarious employment situation, so we spent the afternoon adding up all our debt, then drawing a thermometer and taping it on to our bathroom mirror. We also put together our first budget, and painstakingly combed through it to figure out what we didn’t need. We cut our alarm system, the yard man, and our housekeeper. 3) How did you stay disciplined throughout the process to pay down your debt? Four months after we started our debt repayment journey, my husband was laid off again. Yes, twice in one year. All of the contractors at his company were let go, so he was again without a job, but this time he had no severance package. He contacted everyone he knew, and after an amazingly short time (just over a month), his original company hired him back. Despite yet another setback, we slowly chipped away at our debt over the next eighteen months. Some of it we paid off with the rest of the severance pay from his first layoff. We made extra money selling stuff we didn’t need, including my husband’s beloved Audi sedan. He downgraded to a smaller car. We cut out all unneeded services, and I didn’t get my hair cut or colored for almost a year. One thing we didn’t cut out was eating out. We should have, yes, but we continued to eat once a week at our favorite Mexican restaurant, or occasionally pick up Brazilian takeout. In hindsight, we should have cut this out, but we were under so much pressure and so stressed out, that eating out a couple of times a week became our respite. Many times, when people talk about their debt repayment journeys, they act as if a switch has been flipped, and pre-debt repayment they had terrible financial habits, whereas post-debt repayment they were suddenly, magically, 100% fiscally responsible. But that’s not realistic, and it’s certainly not what our journey looked like. We made the decision to kill our debt, yes. And we did a lot of things better after we made that decision, including cutting out a lot of unneeded expenses. But budgeting was hard, and we weren’t very good at it at first. And we weren’t able to change all of our bad financial habits, like eating out too much, overnight. It was a slow process of gradually getting better at the financial stuff, day by day, bit by bit. The difference this time was that we were committed. If we had a month where we went way over our budget, we recommitted the next month to do better. And despite eating out, despite the imperfect budgeting, we paid off our $38,000 of debt in just eighteen months. 4) Were there any apps, tools, or websites that were especially helpful in paying down debt? We enrolled in Financial Peace University through our church, and it was super helpful in staying committed to the debt repayment journey. We also signed up for Mvelopes, which was an online budgeting tool a neighbor recommended. It was very helpful in helping us budget our money, and we used it for almost ten years, until we switched to YNAB in 2017. 5) What advice would you provide to other young families who are overcome by the stresses of debt? Don’t underestimate the power of deciding. Once you decide that you can no longer live with debt, you will find a way to get rid of it, against all odds. It may take time, and it may be an imperfect process, but if you commit, then you will get rid of it eventually. 6) What was the most challenging part in your journey to become debt-free? Believe it or not, the most challenging part of becoming debt-free was the second part of our journey that happened several years later. We paid off our $38,000 of debt in 2009, and then began to focus on building up an emergency fund and saving for retirement. But it was around that time that my husband was offered a job at a company in New Hampshire, which had a no-layoff policy. After being laid off twice in one year, the job sounded like a dream come true. No more worries about another layoff, job security, and better pay. The company would even pay all our moving expenses from Georgia to the Northeast. We moved to New Hampshire in 2010, right in the middle of the housing crisis. We sold our house at a loss, which the new company luckily covered, and landed in New Hampshire with no debt, but just a few thousand dollars in savings. Moving, even when some of it is paid for, is expensive. 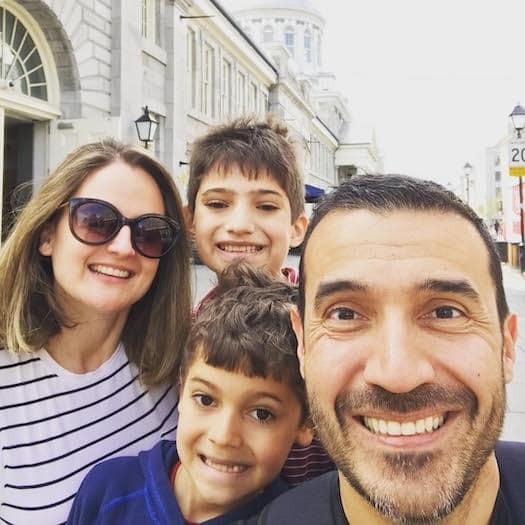 Laurie’s family now, on a recent trip to Montreal. We rented a house for the next two years and saved as much as we could for a down payment. Unfortunately, my car, a used BMW X5, was falling apart. We were committed to keeping it running, but ended up spending over $7,000 on it in one year alone. We decided we couldn’t keep this up and went out to buy another car. In the Northeast, cars weather faster. There’s so much snow and ice that the roads are salted, which means lots of rust. Cars cost more and to get a reliable automobile, we needed to spend more than a couple of thousand dollars. Plus, we were saving up every dollar we could to buy a new house. In the end, we decided to finance a used Honda Accord over five years. It meant that once again, we were in debt. Two years after that, my husband’s CRV, which wouldn’t start about half the time (meaning he had to get his colleagues at work to push him down the hill to start the car), finally died. We decided to finance another car, a used Toyota Prius, over five years as well. Now, instead of being debt free, we had two car payments. At the beginning of 2017, I realized that by paying those two cars off, we’d have over $600 each month we could put towards savings and investing. It seemed like 2017 was the longest year of my life, as I put every spare cent we had towards paying off those cars. But finally, once again, we were debt free. And this time, we had a big fat emergency fund, so we would never finance a car again. 7) How has becoming debt-free changed your family’s life? How do you expect it will impact your family’s life going forward? It really is true that being debt free gives you a feeling of freedom. While we still have a mortgage, it is a fifteen-year mortgage and we plan to pay it off early. But not owing anything else to anyone gives us financial confidence that we didn’t have earlier. We recently bought a brand-new (ok, to us!) car, a 2014 Honda Pilot, completely in cash. Writing that check in the dealership was the most amazing feeling. It made us feel like complete ballers to be able to pay in cash. And we don’t want to lose that feeling! 8) What are future plans for your family after becoming debt free? All of the sudden, not only were we debt free, we were celebrating $100K in net worth, $200K, $300K, and on and on. It grew fast! 9) Are you pursuing (or have you reached) financial independence? While we’re not yet financially independent, because we spend more than the average frugal financial blogger, we’re close. 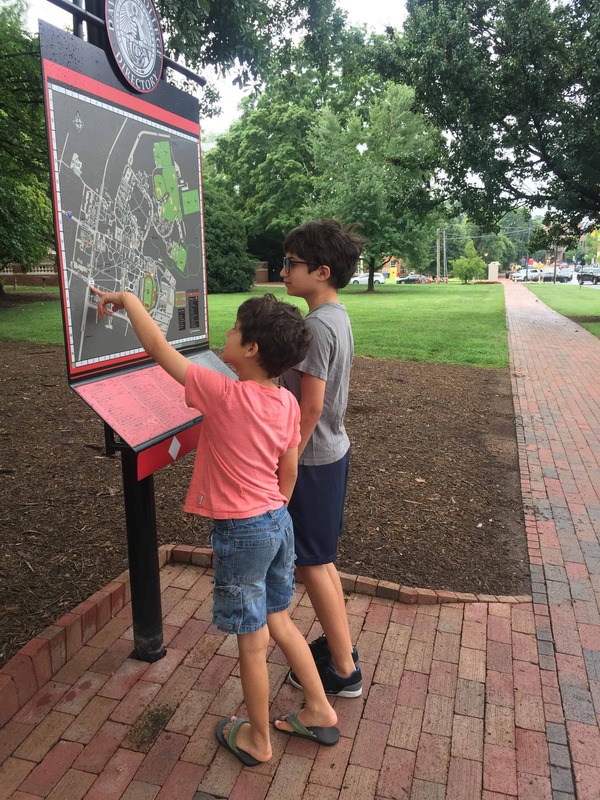 Even so, my husband doesn’t plan to retire until our youngest, who’s eight, goes to college. 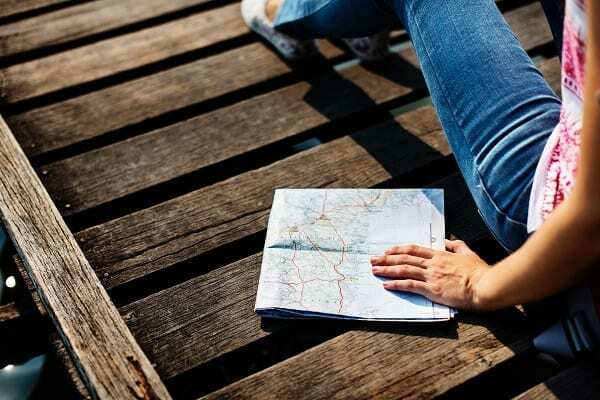 At that point, we’ll have more than enough money in the bank and will be able to enjoy the next phase of our lives, which I hope involves non-stop travel! 10) Where can we learn more about your story? We would love to have you visit The Three Year Experiment to read more about our imperfect journey to location independence and FI. I’m so grateful that our story is being featured on Financial Pilgrimage and hope it encourages you on your own journey to debt freedom or financial independence! If you have any more questions about how we did it, feel free to send me an email at laurie@thethreeyearexperiment.com and I’ll do my best to answer your questions! Thanks again to Laurie at The Three Year Experiment for being willing to share her family’s story. If you have questions, please email Laurie or leave them below in the comments. Thanks for reading! Thanks so much for the chance to tell our story on your blog, and for the kind sentiments about how many words I spewed out in February! 🙂 Hope our story sparks a chord for anyone currently on the same path. I’m so glad we didn’t give up!! Laurie, you are a Rockstar! Thanks so much for sharing your family’s story with us. I’m excited to continue to follow your story as you all continue to do great things!